Technology has a massive impact on our day-to-day lives, right down to the cellular level within our own bodies. Texas A&M University chemists are using it to determine how lipids talk to each other when they interact with membrane proteins, one of the primary targets for drug discovery and potential treatments for any number of different diseases. By capitalizing on their technological expertise to "see" membrane proteins as they interact with different lipids, Texas A&M chemist Dr. Arthur Laganowsky's research group has discovered compelling evidence that these proteins may be capable of recruiting their own lipid microenvironments through allostery, a biological phenomenon first observed in the 1900s and identified in numerous biological processes, including cellular signaling, transcriptional control and disease. The team's work, published today (Mar. 5) in Proceedings of the National Academy of Sciences and led by Texas A&M chemistry postdoctoral researchers Christopher Boone and John W. Patrick, shows that allostery extends to lipid-membrane protein interactions, enabling these proteins to alter their remote binding sites to accept lipids of different types and opening up new possibilities for pharmaceutical drug design and delivery. Protective membranes exist on the surface of all living cells and contain many of our cells' most important proteins, many of which have unique and specialized functions, such as safeguarding the cargo going into and out of the cell that is necessary for cell survival. These membranes are largely composed of lipids, which themselves play key roles in maintaining membrane integrity and ensuring that these specialized membrane proteins function properly. "From this work and our previous work, it is becoming increasingly clear that membrane proteins are exquisitely sensitive to the chemistry of the lipid," Laganowsky says. "Given that lipid composition differs throughout the organs of the body, understanding how the lipid environment in these areas influences protein structure will be critical to opening new possibilities for pharmaceutical drugs designed to affect how these lipids bind with one another." Membrane proteins represent one of the most important targets for pharmaceutical drug discovery, with a staggering 60 percent of drugs on the current market targeting them for their integral role in cellular processes. The crucial role of lipids in the folding, structure and function of membrane proteins is emerging through multiple research reports and channels—findings that are uncovering the intimate roles lipid-protein interactions play in controlling protein structure and function. "In a cell, molecular interactions with molecules are exploited to carry out cellular processes," Laganowsky explains. "For example, when you eat a chili pepper, you feel a hot sensation as a result of a molecule in the pepper binding to a specific membrane protein that, in turn, elicits this response. In a similar fashion, our study has demonstrated that the membrane protein can influence its surrounding lipid environment, and this environment may influence, for example, how molecules are sensed." 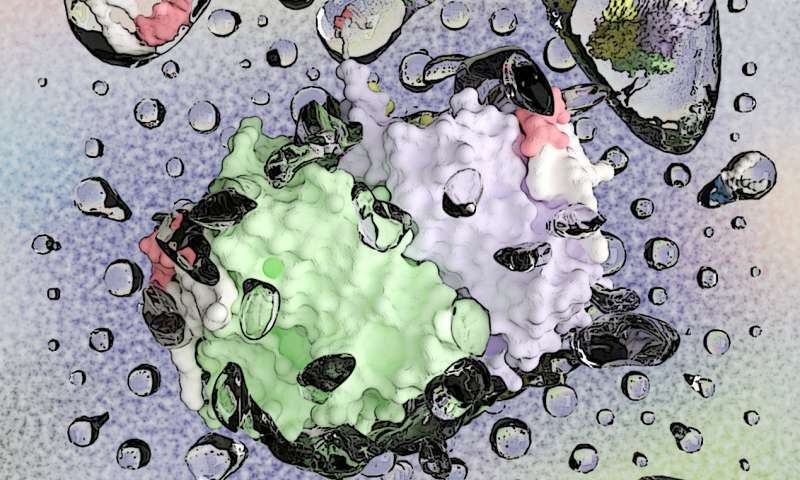 Membrane proteins carry out essential cellular functions, including signaling and transport of molecules across the blood-brain bilayer, which most drugs have a difficult time crossing. These proteins are embedded in the chemically complex lipid environment of the biological membrane, which presents unique challenges in deciphering the roles that lipids play in modulating membrane protein structure and function. To date, technology, or lack thereof, has been the primary barrier to such investigations. Beyond their expertise in using X-ray crystallography to determine the atomic structure of proteins, Laganowsky's lab was one of first in the U.S. to perfect the use of cutting-edge native ion mobility mass spectrometry—a technique he helped develop as a postdoctoral researcher at the University of Oxford—that has enabled his group to decipher the language lipids and membrane proteins use to communicate. By shedding new light on how lipid-protein interactions can enhance or weaken binding of other lipid types, their research is changing our understanding of the structural dynamics of proteins at cellular membrane levels and providing novel insights with the power to transform drug design, development and delivery. "There is a critical need to expand our fundamental knowledge in this emerging field by applying and developing innovative approaches to elucidate how lipids modulate the structure function of membrane proteins," Laganowsky says. "To this end, we continue to study a number of ion channels, receptors and other types of membrane proteins." Wen Liu, Yang Liu and Xiao Cong, former members of Laganowsky's lab within the Texas A&M Health Science Center's Institute of Biosciences and Technology (IBT), also collaborated in the research, as did Dr. Gloria Conover, an assistant research scientist in Laganowsky's group since 2017.